It takes an individual with imagination to appreciate the unique sounds, to visualize color behind style, and to explore the evolution of art. 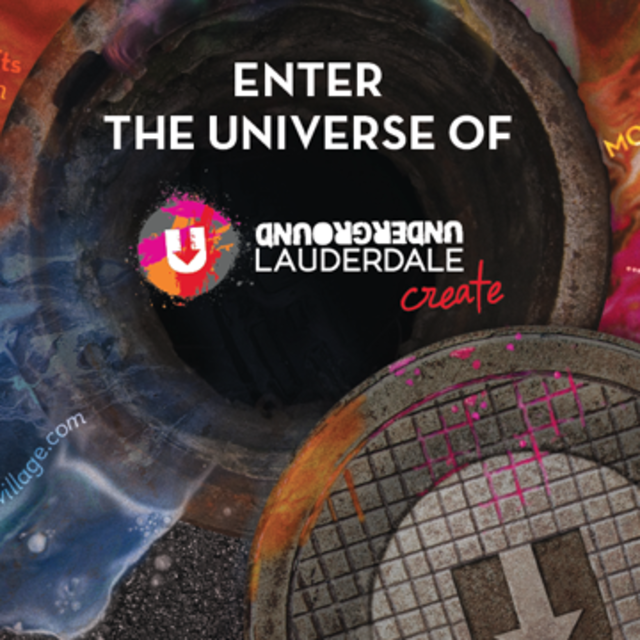 Creativity without the commercial end is what Underground Lauderdale is about...simply the real deal! Click here to order your FREE Underground Create Map. Hip neighborhoods include FATVillage, F.A.T. is trendy. F.A.T. is cool. F.A.T. is growing. And by F.A.T., we mean Flagler Arts & Technology Village in downtown Fort Lauderdale - a new neighborhood that&apos;s seriously amping up the area&apos;s cool factor. Bordered by the Riverwalk Arts and Entertainment District, home to the NSU Art Museum Fort Lauderdale and Broward Center for the Performing Arts. F.A.T. is a section of downtown Fort Lauderdale built in the 1950s of industrial warehouses that&apos;s fast becoming a magnet for emerging artists, galleries, performers, fashion and film. Follow the trail: Mockingbird Trail is an Urban Art Trail, featuring more than two miles of verdant walkways, various outdoor seating elements, exercise routes, contemporary urban design street furniture and over a dozen public art installations. The Trail encourages visitors and residents to get outside – explore. Connect with South Florida’s flora, fauna and neighbors! If you’re looking to add creativity to the mix, a walk through The Downtown Hollywood Mural Project is a must with 20+ curated outdoor contemporary art murals by national & international recognized artists. For film lovers the newly unique Cinema Paradiso theater features independent films to various locations, not to mention you will notice filming crews quite often in Hollywood. Art Fort Lauderdale: a 4-day curated art fair that transports attendees on a journey along the famed Intracoastal Waterway via water taxi and private yacht with stops at vacant multimillion dollar waterfront properties that feature emerging artists exhibiting various styles and methods of art that reflect the past, the present and the future. This destination art fair seeks to highlight the uniqueness of the city and put Fort Lauderdale on the art world map as a premiere location to view, interact with and purchase art along with giving art aficionados, residents and visitors a cultural experience that is memorable, interactive and engaging. Click here to see how the Art Fair takes you by waterway to art-filled mansions. A social movement aimed to cultivate community & culture in Broward by curating and creating events in Greater Fort Lauderdale, highlighting the very best of our community with experiences and memories. Click here for "What&apos;s Going On?" enewsletter powered by Choose954.